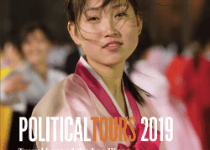 One of Political Tour’s most successful tours to date. Now Jacob Zuma has gone South Africa is faced with the enormous task of restoring faith in the government and the economy. This wide-ranging tour starts in rural KwaZula Natal, passing through the Zulu war battlefields and includes both the townships of Johannesburg and Cape Town. 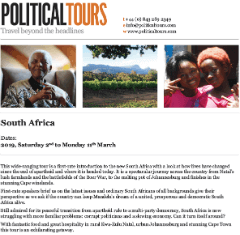 You’ll meet some of South Africa’s top politicians and commentators and get exclusive access to the courts and parliament. The tour ends in the Cape Winelands. Even if you’ve been to South Africa already, you’ll get to see it in a different light on this unforgettable journey. Led by Peter Sullivan, former Editor of the Star Newspaper, SA. We assess the legacy left by Nelson Mandela and challenges that remain. Still admired for it’s peaceful transition from Apartheid rule to a multi-party democracy, South Africa is now struggling with more familiar problems: corrupt politicians and a lacklustre economy. Can it turn itself around? First-rate speakers brief us on the latest issues affecting the country, and ordinary South Africans of all backgrounds give their perspective, as we ask if the country can keep Mandela’s dream of a united, prosperous and democratic South Africa alive. Local communities help us get to grips with the issues South Africans face daily. With fantastic food and great hospitality in Kwa-Zulu Natal, urban Johannesburg and the stunning Cape Wine Lands- this tour is an exhilarating getaway. Led by the inimitable Peter Sullivan, one of the best known journalists in South Africa and former editor of The Star newspaper. Early breakfast with the Official Opposition leader in Johannesburg, a city whose annual budget exceeds that of Botswana, Mozambique and Angola combined. Next we visit the Apartheid Museum that illustrates the rise and fall of South Africa’s era of segregation and oppression. After lunch we drive to Soweto where much has changed in the last 20 years. We look at the range of contrasts, from smart middle class homes and new housing programs to makeshift camps. We also stop by a local “Shebeen,” or Soweto bar. In the morning we get privileged access of the Constitutional Court building with its politically relevant art works. Court clerks brief us on the Court’s current political and judicial role, and provide insight into South Africa’s sweeping and ambitious constitution. Possible tour of Old Fort Prison in the grounds (time permitting) and home for many political prisoners for years. Lunch at the Johannesburg Stock Exchange for a high level overview of the economy and business. Later we have briefings with members of Johannesburg’s leading think tanks on the state of politics and the economy. 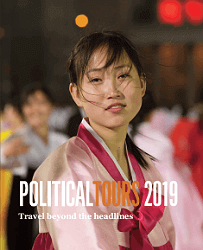 Check out of our hotel and visit to a local school – education is the centre of a fierce political debate with criticism of falling standards, and demands for free university education. Depart for Johannesburg airport and an afternoon flight to Cape Town; we will advise you on the best flight to suit the itinerary. After checking in you have a free evening to explore the downtown area. A tour of Parliament buildings, home to the new and former federal parliaments as well as the Cape assembly. Peter Sullivan recounts some of the key moments in recent history. We visit the District 6 museum and meet with a former resident. Cape coloureds were forcibly removed from this area in the 60s and out to the sprawling Cape Flats, followed by coffee at the Truth Cafe. We learn about the effects of apartheid. Visit the remarkable township on the slopes of Table Mountain at Hout Bay, speak to local activists, see local industry. Lunch is fish and chips on the rocks of Hout Bay, under Chapman’s Peak Drive, one of the most beautiful in the world. Dinner with veteran MP, radio personality, diplomat and commentator who will answer all our questions. A first-hand look at how the wine industry is doing and a look at tourism’s significant contribution to the SA economy. Lunch on a wine farm with stunning views – an excellent way to wind up our tour, before heading back to Cape Town. Farewell dinner with a highly respected former Constitutional Court judge and Deputy Chief Justice. This tour starts on the Ballito coast and ends in Cape Town. Four and five star centrally located hotels. UK passport holders : If you’re visiting South Africa for tourism or business purposes for a period of up to 90 days, you don’t need a visa. Your passport should be valid for a minimum period of 30 days from the date of exit from South Africa. Your passport should have at least 2 blank pages when you present it at immigration to enter or leave South Africa. Other passport holders may require a visa. It is always good to check with the embassy in your country for latest advice regarding visa requirements. It is summer in March. It is sunny and hot in the day. It can be cooler in the evenings. Dress is generally casual and comfortable, comfortable walking shoes are essential. We also have a range of meeting with politicians or senior officials where we are expected to be more formally dressed. For these men will need a jacket (and tie) and women the female equivalent. Electricity supply is 220/230 volts AC 50 HZ. Most plugs are 15 amp 3-prong or 5 amp 2-prong (European) with round pins. Peter Sullivan edited The Star, South Africa’s premier daily newspaper from 1993 to 2000 – through the country’s transition to democracy. In 2001 he was appointed Group Editor-in-Chief of Independent Newspapers 16 South African titles, a position he held until 2010. After teaching and the army he joined the Rand Daily Mail as a cadet reporter before becoming the country’s leading political analyst in Parliament. In the 1980s he interviewed domestic Presidents and Prime Ministers John Vorster, PW Botha, FW de Klerk; in Africa Zambia’s Presidents Chiluba and Kaunda, abroad President Ronald Reagan and Prime Minister Thatcher. He has had many interviews with former President Mandela. Peter has travelled to over 60 countries, many as a guest of their governments. He served on boards from Johannesburg’s waste company Pikitup to The Smile Foundation; brought the Open Society Foundation to SA at George Soros’ request, and has chaired a brace of charities from BirdLife South Africa to The Star Seaside Fund, Operation Snowball and the Hamper Fund. He is currently Chairman of Landelahni, a top recruitment, leadership and assessment company, which occupies a special place as it is owned entirely by people who are black or female. Mandela’s Long Walk to Freedom is a must. Alan Paton’s Cry the Beloved Country is a universal tale of urbanisation and of apartheid. “Khayelitsha: Umlungu in a Township” by Steve Otter is also an interesting (but non-essential) read about racial divides today. The Madonna of Excelsior by Zakes Mda, a novel that looked at inter-racial relations in the 1970s but tells an interesting tale. There’s also a slew of books on SA politics for the Christmas season. ‘Mr Maimane, good evening to you and, with the greatest of respect, who are you?’ This is how journalist Jeremy Maggs began his television interview with Mmusi Maimane in 2011 when he was unveiled as the Democratic Alliance’s mayoral candidate for Johannesburg. Since then, the charismatic Maimane’s rise from obscurity to leader of the DA in 2015 has been nothing short of meteoric. His anointment as leader of the DA made history, marking the completion of this political party’s transformation from ‘white’ political party to one whose new leader shared similar experiences to those of the majority voters. Yet there are those, even within the party, who denounce Maimane as nothing more than a puppet dancing to the tune of white masters. So who is the real Maimane? Experienced political reporter S’thembiso Msomi goes behind the scenes to examine how and why Maimane rose head up the opposition party. He delves into Maimane’s formative years, his time at the pulpit in the church, and his family, to bring substance to the man. Msomi also examines Maimane’s first year as head of the DA in the run-up to the local government elections, assessing how this young man has negotiated the often treacherous waters of political power. Finally, the author attempts to answer these burning questions: is Maimane his own man, and can he deliver the electorate that the DA so fervently desires? Zille takes the reader back to her humble family origins, her struggle with anorexia as a young woman, her early career as a journalist for the Rand Daily Mail, and her involvement with the End Conscription Campaign and the Black Sash. She documents her early days in the Democratic Party and the Democratic Alliance, at a time when the party was locked in a no-holds-barred factional conflict. Before entering politics, Zille made a name for herself as a political journalist and outspoken critic of apartheid, working for South Africa s leading liberal newspaper, the Rand Daily Mail. Zille joined the Democratic Party in the mid-1990s, where she was asked to reformulate the party s education policy. After a term in the Western Cape provincial legislature under the newly formed Democratic Alliance she was elected to the National Assembly as a member of Parliament in 2004, serving on the Portfolio Committee on Education and as the party s national spokesperson. In 2006 Zille was elected mayor of Cape Town and in 2007 took over as leader of the Democratic Alliance. When her party won the Western Cape in the 2009 general election, she was appointed premier of the province, a position that she continues to hold after stepping down as DA leader in 2015. CDE has an excellent series of policy papers and also has useful reading lists for those wanting a more in depth or academic assessment of economics and development in South Africa. There is The Daily Maverick as an unusual and informative irreverent site. For a more academic approach it is worth while seeing some of the papers published by the South African Labour and Development Research Unit – SALDRU. Favourite books on South Africa to read, suggested by friends of our tour expert Peter Sullivan. This is an eclectic mix from a politically savvy group who all are passionate about South Africa. RW Johnson, SA’s Brave New World. CW de Kiewiet, Social and Economic History of SA. Spiral House by Claire Robertson. Fabulous for a million reasons. Innocence of Roast Chicken by Jo-Anne Richards (belongs in the SA canon, with its sympathetic portrayal of a torturer). Zoo City by Lauren Beukes. Won a Hugo award in the US. Devil’s Chimney by Anne Landsman. Grim, but completely evocative. The Track, by Katy Bauer (both set around Oudtshoorn) similar vein, but shorter than Devil’s Chimney. Thirteen Hours by Deon Meyer. Do we presume they’ll have read Long Walk to Freedom and My Traitor’s Heart? And I liked Patti Waldmeir’s book on the transition, Anatomy of a Miracle: The End of Apartheid and the Birth of a New South Africa, which they may have read. Plains of Camdeboo, Eve Palmer. My favourite. Daphne Sheldrick’s “Love, life and elephants” – a delightful read – it provides an unforgettable insight into elephants. Denys Reitz ‘s “On Commando” for an intensely readable taste of the Boer War plus a look at the psyche of an educated Boer. Maberley’s “Mammals of Southern Africa” (revised and updated by Richard Goss) – this is the best guidebook to SA Mammals. Clive Walker’s “Signs of the Wild” – illustrates spoor and droppings. James Clarke’s “Save Me From the lion’s Mouth” the age-old conflict between rural people and wildlife.